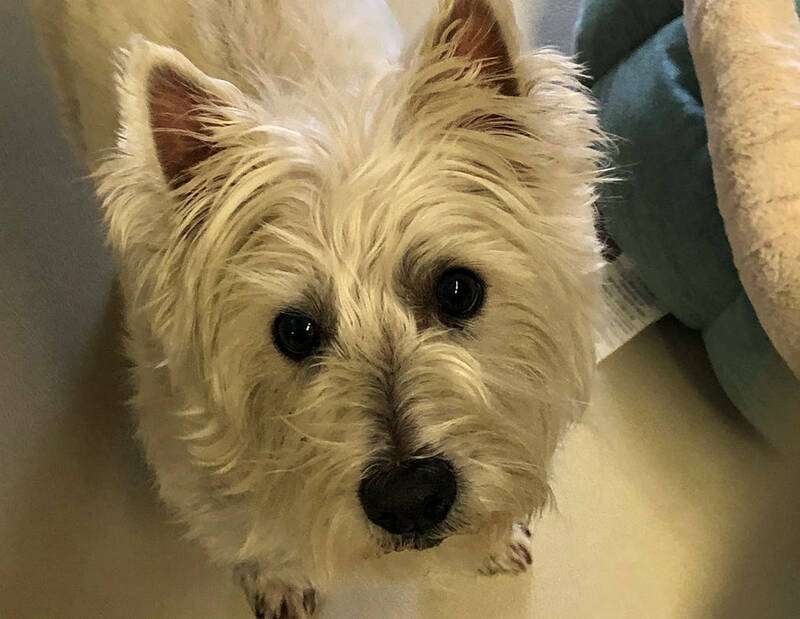 (Boulder City Animal Shelter) Sparky is 9-year-old West Highland white terrier who came to the shelter when her owner passed away. Sparky has had excellent care her whole life and is in good health. She is spayed housetrained. For more information, call the Boulder City Animal Shelter at 702-293-9283. ■ Child safety and welfare program, 1 p.m. today, Jan. 17, in the community room. For those 3-5 and their caregivers. The six-week program is designed to teach people how to keep children safe and happy. Register at the youth services desk or call the library. ■ Romance book club, 6 p.m. today, Jan. 17, at Boulder Dam Brewing Co., 453 Nevada Way. Robyn Carr’s “The Wanderer” will be discussed. An appetizer will be provided; ==attendees may purchase their own drinks and/or meal. ■ Drop-in story time, 10 a.m. Friday, Jan. 18, in the board room. For those 0-5 and their caregivers. ■ Galaxy wine glasses craft, 1 p.m. Saturday, Jan. 19, in the community room. Class size is limited. Register at the information desk. There is a $5 supply fee. ■ Baby lap-sit story time, 10 a.m. Tuesday, Jan. 22, in the board room. For those 0-24 months old and their caregivers. ■ Crochet for a cause, 2:30 p.m. Tuesday, Jan. 22, in the community room. Learn how to make a sleeping mat for the homeless out of plastic bags. ■ Virtual reality lab, 2:30 p.m. Tuesday, Jan. 22, in the board room. For those 13 and older. ■ Toddler story time, 10 a.m. Wednesday, Jan. 23, in the board room. Forchildren 2-3 years old. Throughout January, patrons are invited to stop in the rotunda for cosmic coloring. Participants 18 and older will be given a prize entry if they show their artwork to the information desk librarian. Note: The library will be closed Monday, Jan. 21, in observance of Martin Luther King Jr. Day. Call 702-293-1281 for details, reservations or more information. The Boulder City Democratic Club will host a 2019 kickoff party at 6 p.m. Saturday, Jan. 19, at the Multiuse Building, 1204 Sixth St. Newly elected Clark County Commissioner Tick Segerblom will be the keynote speaker. There will be other guests as well. The evening will feature a potluck, raffles and other surprises. Boulder City Police Chief Tim Shea will be the guest speaker at today’s, Jan. 17, luncheon meeting of the Boulder City Republican Women’s Club. The meeting will begin at 11:45 a.m. in the banquet room at the Railroad Pass Casino, 2800 S. Boulder Highway, Henderson. For more information, call 702-393-1228. The Vegas Viking Lodge, Sons of Norway, will host its 21st annual lutefisk dinner at 3 and 6 p.m. Saturday, Jan. 26, at the Boulder City Elks Lodge, 1682 Boulder City Parkway. The traditional dinner will include lutefisk with melted butter or white sauce, roasted pork, boiled potatoes, peas and carrots, lefse and Norwegian and other cookies. Packages of lefse will be available for purchase. Proceeds benefit the nonprofit Sons of Norway lodge, which promotes Norwegian heritage through special events as well as provides an annual scholarship program. To purchase a ticket, send a check, payable to Sons of Norway, to Gwen Knighton, 2156 Marstons Mills Court, Henderson, NV 89044. Please include a self-addressed, stamped envelope and a note indicating the names of those attending, whether they are going at 3 or 6 p.m., and a telephone number. Tickets are $22 for adults and $10 for children 10 and younger. They must be purchased by Friday, Jan. 18; none will be sold at the door. For more information, call 702-869-5775.